Hope Sewing is Genetic: Overboard? NEVER! So it's quite possible that I've gone a little overboard with squares. I'm LOVING squares right now. From some WIPs that I've posted to some that I haven't gotten to show you yet, to the... FIVE charm square swaps that I'm in, to fabric that I'm buying and cutting up... it's a bit ridiculous. 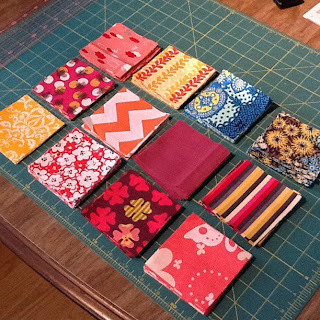 Anyway, last week Fabric Shoppe posted on their Facebook page that they were offering up four free fat quarters with any order over a certain amount, so of course I had to get in on that. Of course. I snagged one of their "A Surprise in My Mailbox" remnant bundles, and was SUPER pleased with the results! Between the "surprise" and the four FQs, this is what I got - plus a bit of Pezzy Prints, which I included for my giveaway winner since I was bad and hadn't sent it yet! Oops! The bundle split itself pretty nicely into two sets of fabrics. I usually ask my husband for input, and he said he dislikes them both because they're too busy. Too bad. I added some fabric from my stash (the pinky-red print at the top) but otherwise, it was all from the bundle. And here's the other set. The blue/yellow print with birds on it was from my stash for this grouping. I don't remember what it is but I got it as a remnant (I think?) 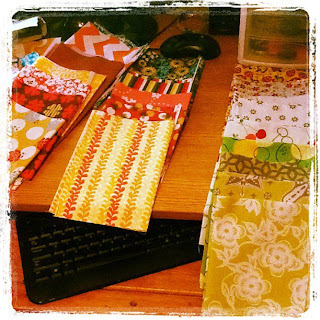 from Sew, Mama, Sew! 's clearance section. The only fabric I wasn't sure about was the gold-with-white-dots-and-red-and-gray-roses-on-it, but I think it will work out okay! 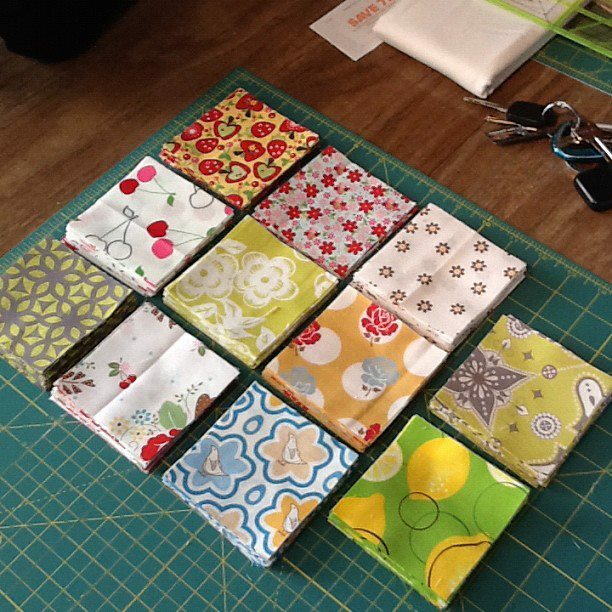 I think I'll probably end up doing more four-patch blocks with these. Any thoughts on what solid to pair them with? I like plain ol' white for the top set but I'm not sure about the bottom. Input is appreciated! Wow, lots of warm colors in there. How fun, I got to order myself a surprise! I think your questionable fabric might be a Riley Blake...? I have seen it a lot lately. Overboard with squares? No... not possible! Love your choices - can't wait to see it put together! Tagged, um, a month ago. Oops.